Talkdesk is one of the leading help desk software apps currently available on the market. No. 1 spot in this category is held by Freshdesk which has a score of 9.8 and has won our Best Help Desk Software Award for 2018. You can try out Freshdesk for free here. Businesses need to keep up and get in touch with their customers and potential clients as part of the grand plan of becoming successful in their respective industries. So what does Talkdesk do is give users a cloud-based call center hub where all calls are channeled and managed without the added costs that come with setting up an actual call center. Talkdesk eliminates the need for an actual call center hub by providing users with an online platform that can handle and manage their calls for them. With Talkdesk, your business can get that fully functional call center setup, enabling you to provide top notch support for your products and services. Talkdesk is intuitive and intelligent, and can integrate with leading business applications and systems, ranging from CRM, ustomer databases, and sales software to mention a few. Many businesses and organizations can use the string of Talkdesk benefits that the system offers. The system can be set up in a matter of minutes. Take and make calls using browser, landline, or IP phones. Gather reliable information from real-time analytics, historical reporting, and monitoring live or recorded calls, and convert them into actionable insights. Streamline all other business operations and processes with Talkdesk’s vast integration options. A popular call center application, Talkdesk is a user-friendly, web-based solution that you can readily use out-of-the-box. It helps your business achieve growth by enhancing customer satisfaction while at the same time cutting customer service-related costs. Using Talkdesk, businesses can create an entire call center in a browser in five minutes. Unlike other outdated and costly solutions that require a long setup and big upfront investment, Talkdesk requires no phones, no hardware, no coding and no downloads – all that is needed is a computer and an internet connection. With one click, Talkdesk integrates with Zendesk, Salesforce, SugarCRM, Shopify, Infusionsoft, Olark and others to provide comprehensive information about customers. With Talkdesk, your customer calls are directed to the rep who is among the most capable to address a caller’s specific needs. This is made possible by the platform’s intuitive integration of skills-based, ACD, and IVR call routing technologies. The receiving customer rep can readily access the caller’s relevant data in real time, thus ensuring issues are resolved and customers are satisfied with your quality service. For calls from new customers, Talkdesk automatically creates and integrates new contact information into the system. For missed calls, the platform automatically sends an email to ensure no customer inquiries are left unattended. The email includes relevant information, including call details and voice mail data. With real-time and historical reporting, call monitoring and call recording, agents and managers can make sound, technology-supported decisions based on up-to-date, comprehensive customer information. What Problems Will Talkdesk Solve? Ensure personalized customer interactions and increase customer satisfaction with a well-informed, efficient team. Allow for easy collaboration between agents and departments by integrating your sales, marketing and support departments. Reduce call handling time, increase agent productivity and personalize the customer experience with readily available information about the customer, pitching relevant items and solving problems quickly. This customized information will also enable your agents to proactively deliver relevant information to your customers. This creates more revenue opportunities, increases customer satisfaction, shortens collection cycles and decreases inbound call volume. With Talkdesk’s lead generation and nurturing system, integrations and notification system your team will be well-equipped to generate more leads, increase conversion rates and close more sales. It's crucial to realize that almost no software in the Communications Software category is a perfect solution that can fulfill all the needs of different business types, sizes and industries. It may be a good idea to read a few Talkdesk reviews first as specific software can perform well exclusively in a very narrow group of applications or be designed with a very specific industry in mind. Others may work with a goal of being easy and intuitive and as a result lack complicated functions desired by more experienced users. There are also software that cater to a large group of customers and offer a powerful feature toolbox, however this frequently comes at a more expensive cost of such a service. Ensure you're aware of your requirements so that you pick a service that has specifically the elements you look for. How Much Does Talkdesk Cost? We realize that when you make a decision to buy Communications Software it’s important not only to see how experts evaluate it in their reviews, but also to find out if the real people and companies that buy it are actually satisfied with the product. That’s why we’ve created our behavior-based Customer Satisfaction Algorithm™ that gathers customer reviews, comments and Talkdesk reviews across a wide range of social media sites. The data is then presented in an easy to digest form showing how many people had positive and negative experience with Talkdesk. With that information at hand you should be equipped to make an informed buying decision that you won’t regret. If you need to make calls, this is it! Gets an A+ from me! What are Talkdesk pricing details? What integrations are available for Talkdesk? Pros: The system provides us with very impressive tools and functionalities including live call monitoring, phone IVR, integrations for Zendesk, a fantastic reporting dashboard, and personal voicemails and extensions. The best part is that we can contact Talkdesk to discuss ideas that will enhance our workflow and efficiency and then they would configure the settings so we can implement the changes we want. Cons: Everything in Talkdesk is okay except for that one thing that we experience with our Zendesk integration. It automatically add a fake email address for calls. This flaw has resulted in a number of suspended tickets in our Zendesk account. 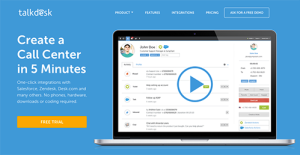 Pros: I love their recording functionality as well as their integrations with helpScout and Salesforce. Talkdesk has so much potential and their CRM features are great. We don't have any experienced with dropped calls so far. Cons: In most cases, we have to work the integrations manually as they rarely work automatically. Calls have to be tagged and sometimes, there are cases of delays in our calls, one to two seconds. We called support and the solution they suggested meant massive overhaul of our current setup. It is a life-saving tool! Distributed companies should have Talkdesk! If you need more information about Talkdesk or you simply have a question let us know what you need and we’ll forward your request directly to the vendor.